Global leader in the design, manufacture and supply of digital radio products, systems and applications, the Sepura Group has expanded rapidly across the world with a network of regional partners. Business Development Manager, Dawn Griffiths, reveals the challenges with airport critical communications and what to expect from the future. 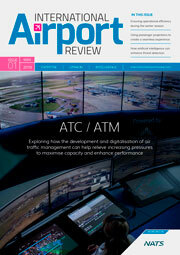 What are the challenges with providing effective and secure radio communications services to airports? Airports are large venues with varying requirements for different areas such as security, operations and passenger and vehicle movement – a range of user groups with varying technical and operational needs. This mix of requirements and stakeholder groups means a flexible solution is required that can address multiple users’ needs whilst maintaining security at all times. How does Sepura’s SC20 radio help with data sharing amongst airport stakeholders? The SC20 allows quick and efficient data sharing between the user and the control room, ensuring that information reaches decision makers as soon as possible, often without the need for lengthy voice calls. This can enable key functionality, such as regular status updates, to allow swift reallocation of personnel to underperforming units or the sharing of vital information such as imagery of suspect individuals, building layouts and plans or technical data. In addition, customisable apps maintain a full audit trail, vital for performance reporting and post-event monitoring. What are the benefits of Sepura’s infrastructure? Our TETRA infrastructure delivers excellent coverage, security and reliability in a platform designed for efficient implementation and cost effective scalability. It provides a scalable, flexible solution, which can offer effective coverage across airport buildings and installations – including runways, walkways, passenger areas, cargo areas, hangars, underground areas and parking – whilst, crucially, offering full integration with other existing airport systems, allowing for best return on investment. How have Sepura’s solutions been received in the industry to date? Over 50 major airports worldwide rely on Sepura’s critical communications solutions for safety and efficiency, including John F Kennedy International Airport and Los Angeles International Airports in the USA, Charles de Gaulle Airport in France, and Penang and Kuala Lumpur International airports in Malaysia. This is backed by Sepura’s strength within other sectors, such as public safety, where we hold a market-leading position in over thirty countries. How do you see the critical communications industry evolving going forward? The key requirement in the future will be greater access to data, with improved speed of access, on futureproof platforms. Our Nebula hybrid TETRA/LTE infrastructure is designed to support the evolution of critical communications, offering broadband – and all its attendant benefits – whilst maintaining TETRA’s inherent security capability.